As spring arrived, we started hearing rumors that changes were happening at Dockside Bar & Grill in North Tonawanda. 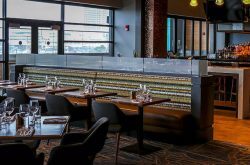 When the time came for canalside dining without threat of hypothermia, Dockside was at the top of our list. It turns out, the changes made were big. 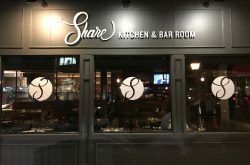 Expect a new chef, hailing from Black Rock Kitchen & Bar (one of our favorites), a new owner, a refreshed look and a whole lot of new hours to enjoy. Dunbar Berdine from BRKB is now head chef, bringing a new menu to the table with homemade staples and fresh daily specials. The new owner, Jay Shepard has cleaned up the place, keeping the waterfront theme and feel – exactly what should sit on this plot of land. We battled a few clouds and some gusty wind on the day we visited, but we were able to tough it out on the patio while the weather was still short of summer. The views from the restaurant are joyful, sure to put you in a good mood. I can only imagine what it will be like on a hot day in the middle of July. If you happen to miss patio dining, or summer crowds aren’t your thing, you’re in luck. The plan is to remain open year-round, lunch hours included. Am I the only one wondering how they possibly had a restaurant on this canal awesome spot and only served dinner? Thank you Jay for making the right decision. 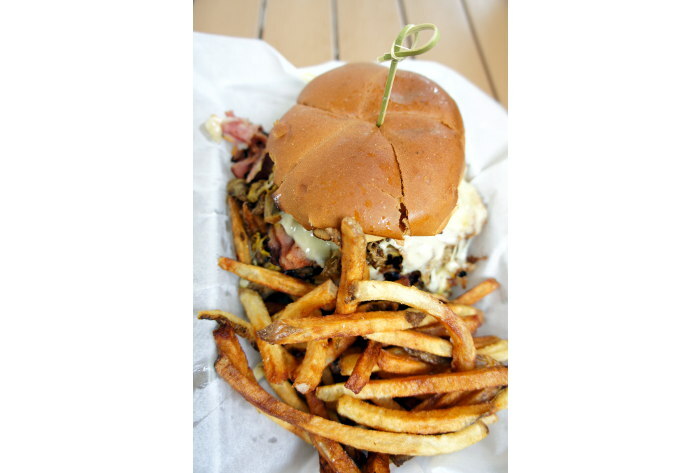 The lunch menu is the dinner menu, with the exception of daily specials, sometimes varying from lunch to dinner. Chef on a whim – I like it. The menu is concise, offering options but not crossing the line to overwhelming. Again, I like it. You’ll find about 10 appetizers, from fresh cut onion rings to clams, mussels, fish tacos and buttermilk marinated chicken tenders, country fried. There’s a price point for everyone, ranging from $5 to $18. 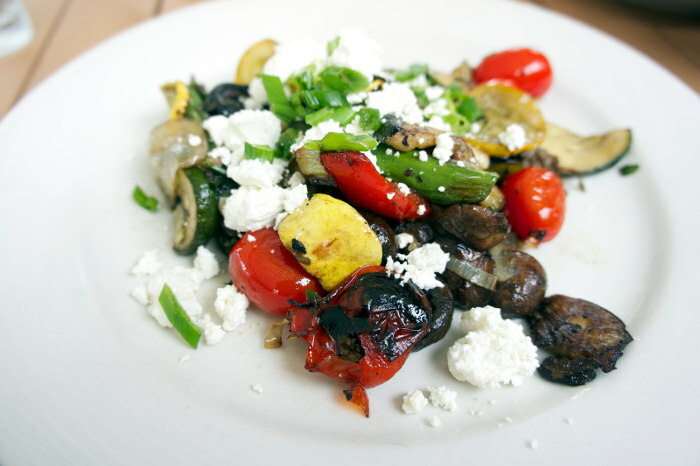 We tried the Grilled Vegetables and Goat Cheese, $11. Big enough for an entreé this app was deliciously satisfying. I could have (should have) stopped there. The soft clumps of cheese and sprinkle of green onions complemented the medley of nicely roasted mushrooms, zucchini, cheery tomatoes, onions and peppers. 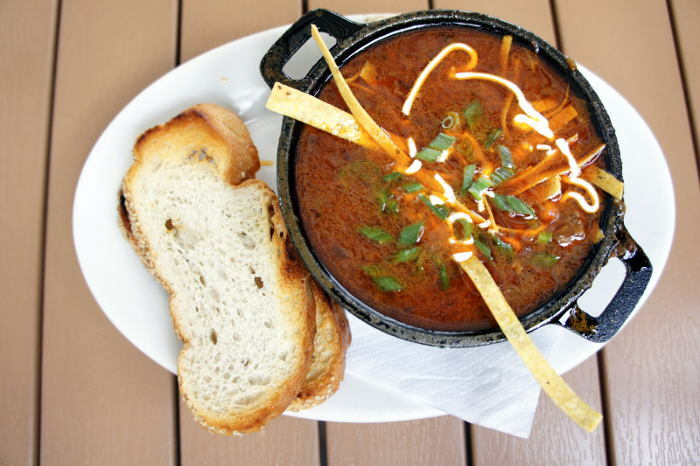 My companion ordered the soup special, Black bean and steak chili. It was served in a baby crock with a side of toasted bread and topped with tortilla strips and crema. I wanted to love this, I really did. I loved parts of it, but as a whole it was a little oily for my taste. The chili element didn’t stand out. Points for creativity, some refinements needed. If you’re in the mood for a salad, choose from some standard choices, greens, caesar, wedge or opt for something more interesting. My vote is for steak and arugula with Vermont Creamery goats milk feta, tomato, kalamata olives, red wine vinaigrette and grilled pita ($13) or burrata with tomato, blanched green beans, crisp prosciutto, basil and balsamic syrup ($12). 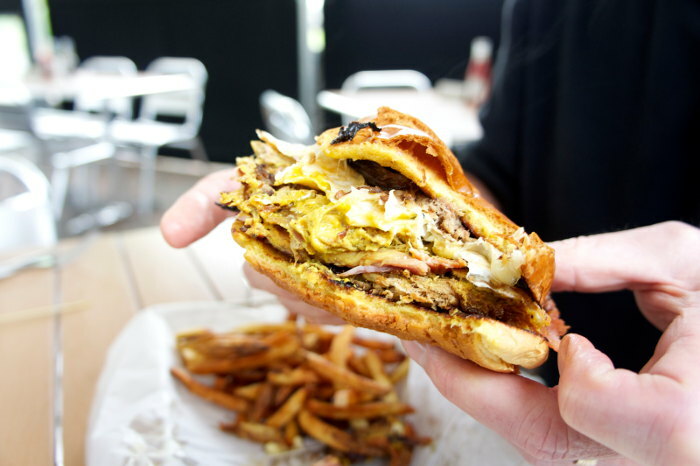 As for the main event, you’ll find a few intriguing sandwich options as well as some you know and love. I ordered the Super Stinger ($14), unaware that this is a traditional North Towns sub. I was informed after the fact while bragging about my over-the-top, unnecessary (in a good way) lunch to a North Towner that must have thought I was born yesterday. As a stinger virgin, I have to say this was the best one I’ve had. 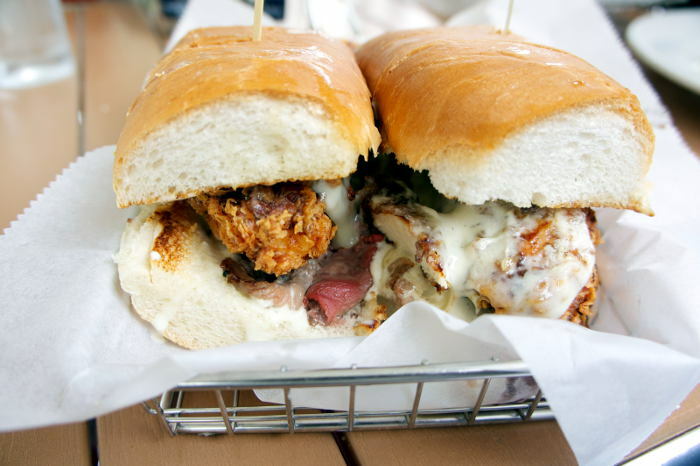 For those of you that don’t know, a stinger is a steak sub with chicken finders on it. Or is it a chicken finger sub with steak on it? I can’t remember. Anyway, this one was delicious with homemade, buttermilk fried chicken fingers, gooey blue cheese and NY strip on a strong, fresh hoagy roll. These weren’t your average fingers (mostly bread, shreds of chicken). They were thick, moist chicken breasts, lightly breaded. I ordered fries on the side and was delighted with freshly cut, soft, thin potato sticks. My companion ordered the Roasted Pork Sandwich with pit ham, swiss, a fried egg and pickles on an egg roll with horseradish mustard ($11). This baby was big. Pig on pig – does it get any better? The mustard was the highlight if you can believe it. Like everything else, the meat was good, all working together nicely. Aside from a few daily specials, a reuben on the day we visited, there’s nothing else to the menu. They are keeping it simple, bar and grill through and through. Inside or out, you’ll have a nice view of the canal and the walkways along it, no doubt getting busier by the day. This menu offers exactly the kind of food I’d hope to munch on as I people watch, and follow boats gliding through the water. Our service was good. Everything we ordered was available. I can’t say the same for the lunchers at the next table. They took it like champs and the server was very apologetic, offering the recent busy Memorial Day weekend as an explanation. Hey, if they don’t have it, it wasn’t meant to be. Onto the next one. The beer list had a few surprises on it, enough to impress me. The Purple Haze, Bells 2 Hearts Ale and Southern Tier IPA on the draft menu did the trick along with EBC Blueberry, Harpoon IPA and Magic Hat #9 in bottles. The space is nice, not upscale but enjoyable and friendly. Temps have risen (for the most part) and there’s no snow in the forecast. Time to head to the canal, find a spot in the sun, sit back and relax – Dockside.